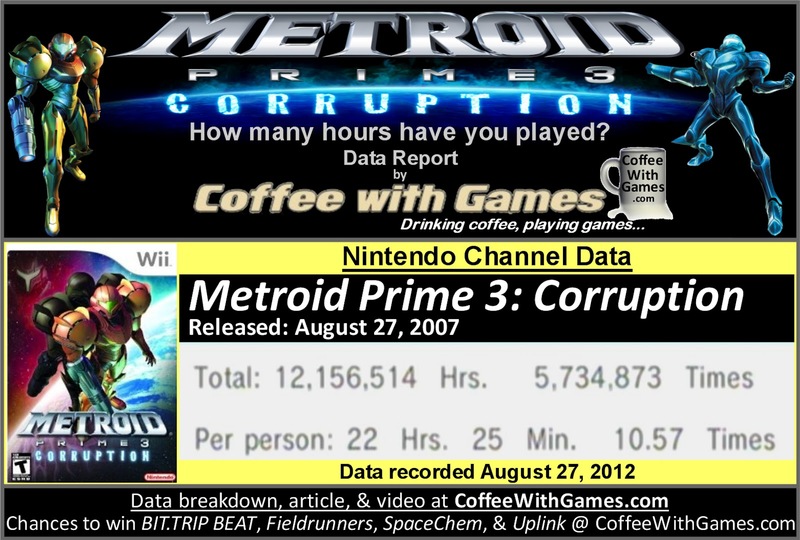 Coffee With Games: Metroid Prime 3: Corruption turns 5! 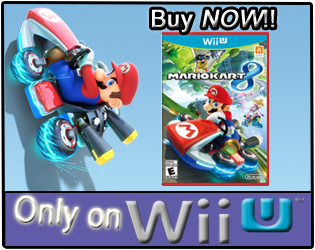 How many hours have U.S. Wii owners reported playing it? Metroid Prime 3: Corruption now has approximately 542,561 U.S. Wii owners that have reported game-play data since the game released, with 1,827 days possibly reported. The game has about 25,965 more Wii owners that have reported data through the Nintendo Channel since last year's report. Corruption's play-time per day/session is still the same as last year's, 2 hours 7 minutes; and the game's overall reported average is the exact same as it was last year, still sitting at 22 Hours 25 Minutes "Per person" that has reported data as the image above shows. Have the critic and customer review scores changed any for the game over the last year? Well, the "professional" critic review score average is still the same at 90.16%, based on 66 reviews on GameRankings.com. The customer review score average has slightly changed though, increasing just a bit over the customer review score average from last year. Corruption now has a customer review score average of 87.02%, based on 148 customer reviews on Amazon.com. Seeing the average reported being 22 Hours 25 Minutes "Per person" makes me think most Wii owners that have reported data are completing the game just once, and not playing through it again. I played through the game multiple times, and I'll show how many hours I have played it in the comment section below by attaching my reported game-play hours image to my comment. I don't know why Nintendo stopped printing both Metroid Prime 3: Corruption and the Metroid Prime: Trilogy bundle, but I think they should add one of them to the Nintendo Selects lineup, and/or have them available to purchase on the Wii U's eShop when it launches later this year. If you are here looking for how to enter to for a chance to win the games mentioned in the data image, you can find more information HERE. If you have already entered the contest/giveaway, just tweet out this post using the "Tweet" button below and add @CoffeeWithGames to it for an extra entry, and you can get an additional if you have "liked" the CoffeeWithGames Facebook page found HERE, and you simply "like" this post on the CoffeeWithGames Facebook page. Have any of you played Metroid Prime 3: Corruption, perhaps in the last year even, and what did you think about the game? Good, or bad? If you have played through it completely, do you know how many hours you have played the game? Also, do you think Nintendo should add Metroid Prime 3: Corruption to the Nintendo Selects games in some fashion? You know, I've only ever played the first Prime back on the Gamecube, and it was awesome. I've always wanted to pick up the Metroid collection for the Wii, but it sold out of new stock pretty fast and the used price became ridiculous. 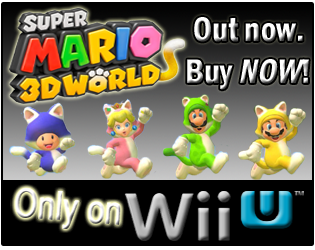 I definitely wouldn't object to seeing this as a select, or better yet a re-release of the trilogy designed for the Wii. My son and I have been been eying that for awhile now. "I've always wanted to pick up the Metroid collection for the Wii, but it sold out of new stock pretty fast and the used price became ridiculous." How many hours do I have reported playing Metroid Prime 3? Only about 10 times the reported average! I think saying I enjoyed the game, just based on the overall average "Per person" and my average, might be an understatement. You can see my reported time for the game in the image attached below. I wish Nintendo would re-release Metroid Prime Trilogy as a Nintendo selects. I missed it the first time and regret it dearly! I was able to get it at gamestop about two months ago for 60 dollars, it was the only one there, and I was only able to get it because the person walking out when I went in was muttering about "seeing what it cost online before buying it"
Boy did he make a mistake.